I didn’t have time to contemplate any of these questions during the seminar, but I had plenty of time to feel frustrated. Stance work led to the question of where I had the most power? As Ed Parker wisely put it, ‘To see is to be deceived, but to feel is to believe.’ I was asked to discern where I felt the power in what I was doing. Such a thing was hard to do in the air, so I resolved the issue by hitting a punching bag. As I have found to be true throughout my training, you can execute a drill in the air a thousand times and hit a punching bag a thousand more, but everything goes out the window once you have to defend against an actual attack. ‘Hammer, thrust, whip’ is easy to execute, except when a punch is coming your way, or a kick for that matter. At the front of the technique line, I defended against several attacks, always responding with the same pattern. At this point in the seminar that Sifu Brosten revealed to us a crucial observation. 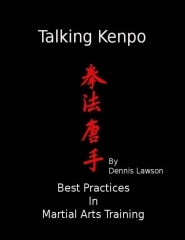 This simple pattern actually occurs repeatedly in the kenpo system. All this time in the technique line I had been working the base pattern behind ‘Alternating Maces,’ ‘Reversing Mace,’ and ‘Leaping Crane.’ Sifu Brosten expressed to us how much benefit we could see in our training time by practicing this pattern, how it is possible to train multiple techniques at once. I couldn’t help but get excited at this realization. At my current rank, my mind is already swimming with 106+ kenpo techniques. If I could train 10 techniques by training one simple pattern, what a huge benefit to my training time! By the end of the seminar, I was mentally and physically spent. I had worked the ‘Hammer, Thrust, Whip’ pattern countless times, incorporating principles and stance changes. I used the pattern to defend against attacks. I worked the pattern in conjunction with foot maneuvers. And still I felt like I had so much more to learn, so much more to gain from its study. Though I ended the night exhausted and a little bit frustrated with myself, I walked away from the seminar with a valuable training tool and a greater understanding of Ed Parker’s American Kenpo.